You can buy garlic in bulk so you never run out! As long as you store it properly, garlic can be kept for 3-5 months, or even longer in your freezer. When you buy fresh garlic, look for heads of garlic with tight skins. If the outer layers of the garlic skin are very papery and loose, it’s an indication that the garlic is older and may not keep as long. 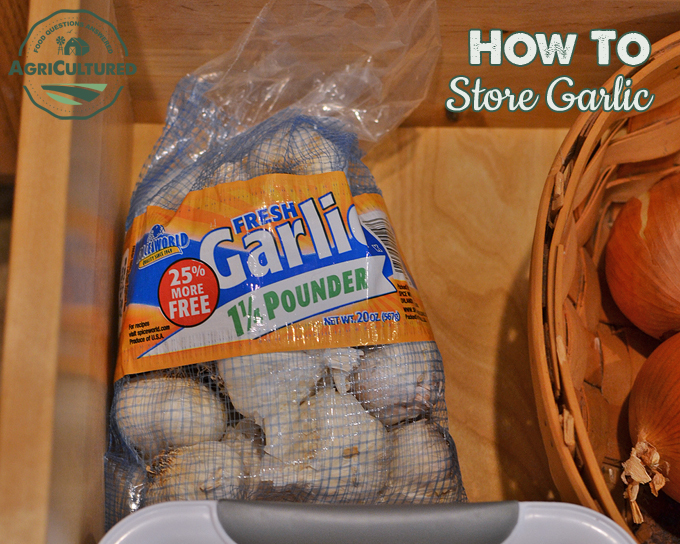 Storing garlic the right way will help it last even longer at home. Store garlic heads intact. Garlic heads should be stored in a cool, dry, dark place with plenty of air circulation. Store garlic heads loose or in a well-ventilated container like a mesh bag, plastic bins, or a garlic keeper like this one. The important things are to protect the garlic from moisture, light, and heat. If garlic is stored correctly, it should last for 3-5 months. Once garlic has been peeled, chopped, or minced it should be refrigerated. If you’re using jarred garlic (and I love to keep some of this around for a cooking emergency! ), refrigerate it after it’s opened. Use garlic within 3 days, like any leftovers. Jarred garlic can be stored in the pantry until it’s opened, but should be refrigerated after it is opened. Once the jar is open, go by the dates on the packaging. After you roast garlic, it should be refrigerated. Remove the roasted cloves from the papery peel, wrap them tightly in plastic or in a plastic or glass container with a lid, and refrigerate for up to 3 days. If you have too much garlic to use before it goes bad, you can freeze extra garlic. Wrap whole garlic heads tightly in plastic (I like Ziploc freezer bags) and freeze whole. Simply break off as many cloves as you need when you need them. Freeze extra roasted garlic as whole cloves in freezer bags. Minced or chopped garlic can also be frozen. Put it in a freezer bag, and it will freeze into a soft block. Just break or grate off as much as you need and put the rest back in the freezer. Garlic can be stored in oil, in the right conditions. Because garlic has a very low acid content, it is prone to growing Clostridium botulinum, the bacteria that causes botulism. Botulism is an emergency, and can be fatal. (Get more information about botulism here.) In low-oxygen conditions (like stored in oil), it is even more likely that this bacteria will grow. If you are going to store garlic in oil, peel all the outer papery layers of skin off the garlic. Put the whole cloves in a container, and completely cover the cloves with oil. This must be refrigerated to reduce the chance of botulism. Do not store garlic in oil at room temperature. Caning garlic at home is not recommended. As mentioned above, garlic is a very low-acid food. The low acid content plus the lack of oxygen after the garlic is canned means it is at very high risk to grow Clostridium botulinum. This bacteria causes botulism, and can be fatal. (Get more information about botulism here.) The best way to store garlic long-term is in the freezer. 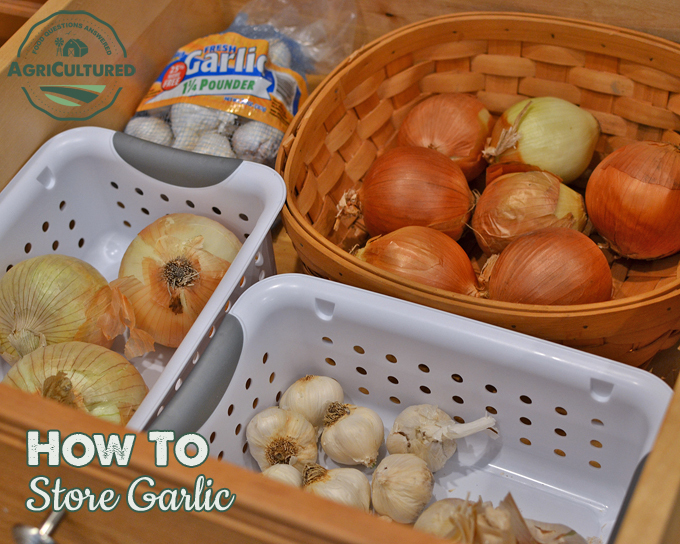 Now that you know how to store garlic for a longer time, how will you use it? Like garlic? You’ll love these recipes!